This is a story of how a best friend, one groovy dad and some enticing imports made the summer of 1994 one for the ages. As a kid, I’d always dreamt of having one perfect summer. And 22 years ago… I found it. Some summers stay with you forever. Some more than others. On any given hot, lazy June Saturday afternoon, I still can’t help but think back to that fateful day. It was a summer of discovery… a summer of magic… THE SUMMER OF IMPORTS. There’s something about summer and gaming that goes together; especially though, when we were kids. There was a magic to it. Nothing completes a healthy childhood quite like sharing it with a best friend. While I had my legendary out-of-town gaming crew, I was fortunate enough to have a best friend outside of that group, Nelson, who lived within walking distance. We grew up together being best friends since Kindergarten. He and I were often in the same class together and we shared the same interest in just about everything. We spent a bulk of our weekends hanging out and playing games. Whenever I think back to my childhood or to the glory days of gaming, inevitably, Nelson always comes to mind. I’d like to take a moment to pay my respects to the memory of renting games back in the ‘90s. Every weekend my dad would take me to the local rental store(s) and I would pluck out one title to bring back home. My brother, Kevin, was too shy or embarrassed (or both) to go rent games, so he always made me his little grunt to carry out the deed. Though I was renting the games he wanted (well, at least most of the time…) there was always something magical to those pseudo-adventures my dad and I shared. It was a weekly tradition, rain or shine. Sometimes, even Nelly would join me on those renting excursions. And there was one such instance that happened 22 years ago that left an indelible mark on us, making that summer one he and I would never forget. The year was 1994, and as the final piercing school bell of that year rang, the euphoric cries of 800 kids rang out even louder. We all knew what stood ahead: 2 and a ½ relentless months of splendid carefree summer days: no teachers, no homework, and no school to interfere with our final days of childhood. As much as I love the fall and winter seasons for Halloween and Christmas, there is nothing… and I mean NOTHING… like summer time, especially when you had a best friend like Nelson to share it with. He and I had just finished the 5th grade together. It was the best year of my childhood. My best friend was in my class; we had Mr. G, the best teacher ever; we had the two hottest girls in our class, Elaine and Jennifer, and Nelson and I were simply at the top of our game. We were 10 years old, going on 11 that summer. We had come of age, and that summer was one for the ages. Nelson rode his bike over the very first Saturday morning of that summer and my dad drove us to Game Hunter. Game Hunter was a legendary privately owned video game rental store. It was renowned in my neck of the woods for catering to the diehard gamer. Game Hunter didn’t bother to waste time with movies. It had every video gaming system library under the sun from the 8-bit Nintendo to the Neo Geo. Being able to actually touch and pick up those classic bulky Neo Geo boxes was incredible. Game Hunter even housed an arcade machine or two, plus they had a small anime section. How many stores could claim that?! Simply put, Game Hunter was a little slice of gaming paradise. But, what made them stand out was their unforgettable import selection. 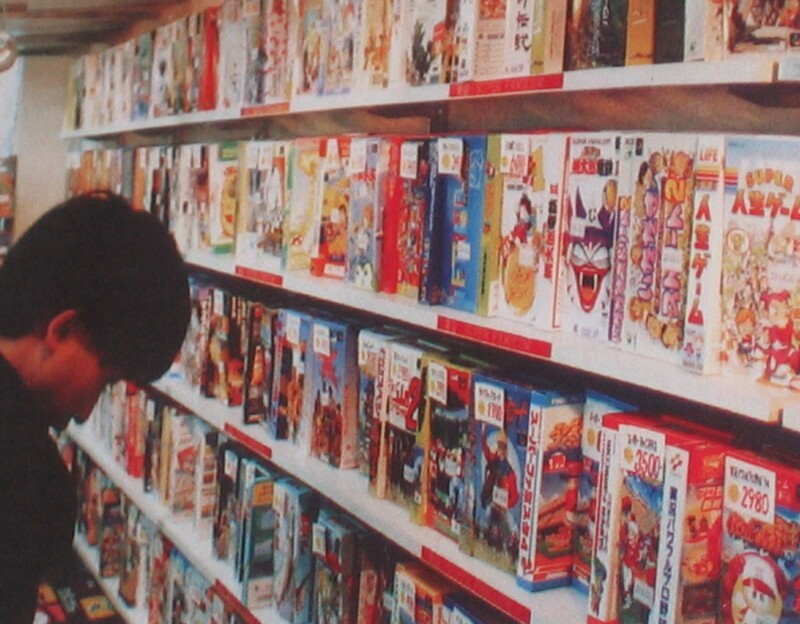 Back then, imports symbolized a whole lot more than merely just the Japanese version of a game. 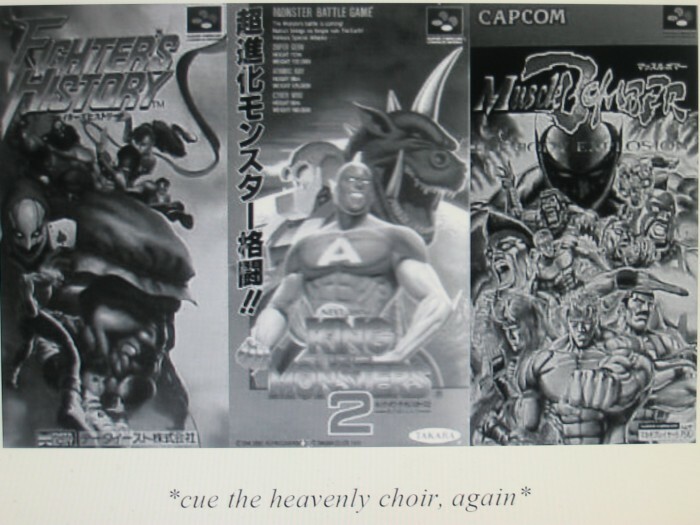 Indeed, back then, imports held a certain aura of mystique to them, especially when you read all the little blurbs on those games in Electronic Gaming Monthly and DieHard GameFan on a monthly basis, realizing that they were an ocean away and that you would never even so much as sniff one. Seeing a wall covered by hundreds of Super Famicom boxes never failed to amaze my little ten year old eyes. They sat on the very top shelf, purposely out of reach. It was symbolic, even. They would cover the entire upper wall from left to right. You were completely mesmerized as your eyeballs darted from one treasure to another. It was a never-ending parade of divine, exotic esctasy. These were games that were either Japanese exclusives, or Japanese versions of games that were set to hit American soil a month or two later. 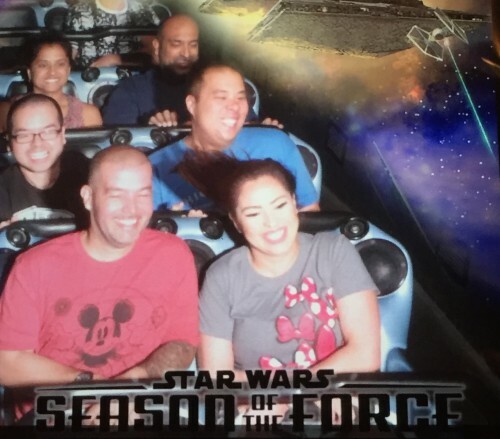 It was nothing short of magical, and a time in my life that I’ll always cherish. Game Hunter’s origins began innocently enough on what appeared to be just another ordinary Saturday morning. But as fate would have it, this particular Saturday morning was anything but. My dad and I were set to embark on our latest renting escapade together. But first we had to stop by my cousin’s house which was a good 15 minutes away. After that my dad needed to run an errand at the local drug store a block from my cousin’s house. I didn’t mind as I always enjoyed being out with my dad, especially after a long school week. Little did I know that fateful morning I would stumble upon GAME HUNTER. The store was decked out from top to bottom with video games from every system imaginable. You had the 8-bit Nintendo, Neo Geo, handheld games and everything else under the sun. I wasn’t a religious kid but I’m pretty sure I thanked God right then and there. I made my way over to the SNES section looking for my brother’s requested title of choice. When I happened to gaze up, I discovered the upper shelf teeming with hypnotic Super Famicom imports. At that point, all bets were off as I had officially gone rogue. Sorry, Kevin. Power Athlete caught my eye. My dad lifted it off the top shelf and I examined the back of the box. 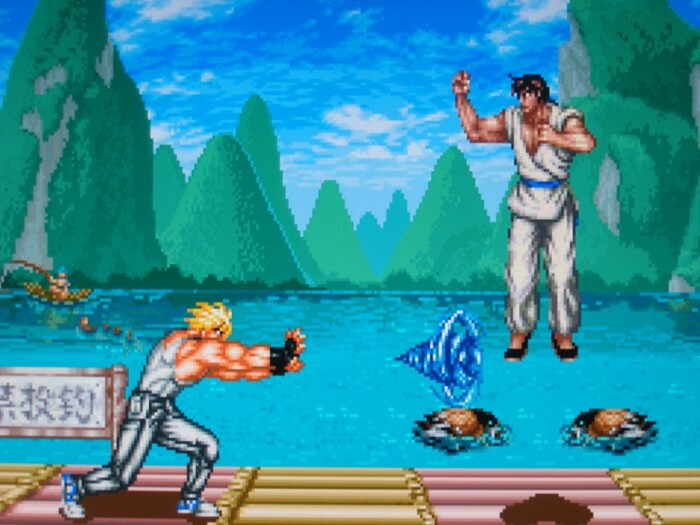 It was a Street Fighter II clone. Sold! 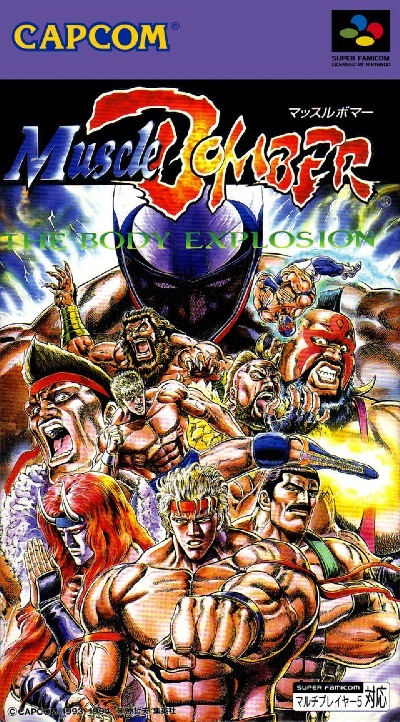 My dad obliged and that day I came home with the Japanese version of Power Moves. My brother flipped out because A). I disobeyed him and B). we found out that it didn’t even play on our Super Nintendo; it refused to fit inside the cartridge slot. I had never seen my brother so damn angry before. I promptly called Game Hunter to let them know of my plight, and they explained how I had to rent the device that allows one to play import games on an American SNES. Yeah thanks guy, you could have warned me about that before I left. Yeah, let’s just say Game Hunter was never known for their stellar customer service. But, much like how one goes to Five Guys for greasy goodness, we went to Game Hunter for their legendary and vast gaming library. After all, nobody goes to a concert for meditation. Luckily, they still had one in stock and said they would hold it for me. So, being the great father that my old man was, we traveled back to Game Hunter to pick it up. This time, even my brother came along as he himself wanted to come see this new store that I’d hyped to the moon. Once there, our pops rented the special converter adapter for a dollar while Kevin and I stood there gawking at the import selection. The very next week, he and I went back and we picked up our 2nd import game, The Combatribes. We had fun terminating Martha Splatterhead and her sleazy gangs. Game Hunter became our new favorite store. It was revered within my gaming circle for damn good reason. There Nelson and I stood, eyes popping, drool coming down the side of our mouths. 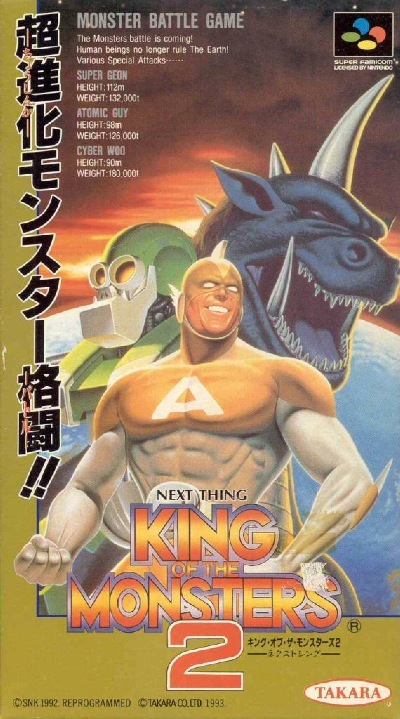 On the very top shelf sat the Super Famicom ports of Fighter’s History, King of the Monsters 2 and Saturday Night Slam Masters (Japanese name Muscle Bomber). These were 3 arcade-to-SNES conversions that Nelson and I were dying to play! And on that idyllic June Saturday morning there they stood right before our very eyes. Their US counterparts were still weeks, even months away! After a brief moment of dead silence, Nelson and I looked at each other in astonishment. 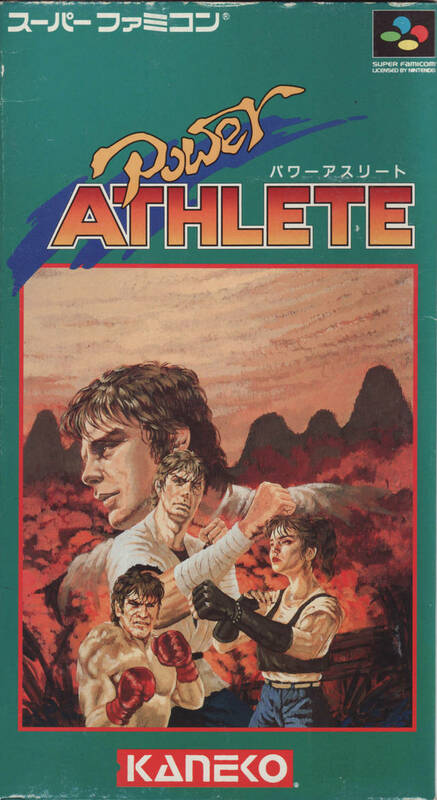 And just like how it was over a year ago when I first saw Power Athlete, at that precise moment in time I’d forgotten whatever game my brother wanted me to rent. Once more, I had gone rogue. 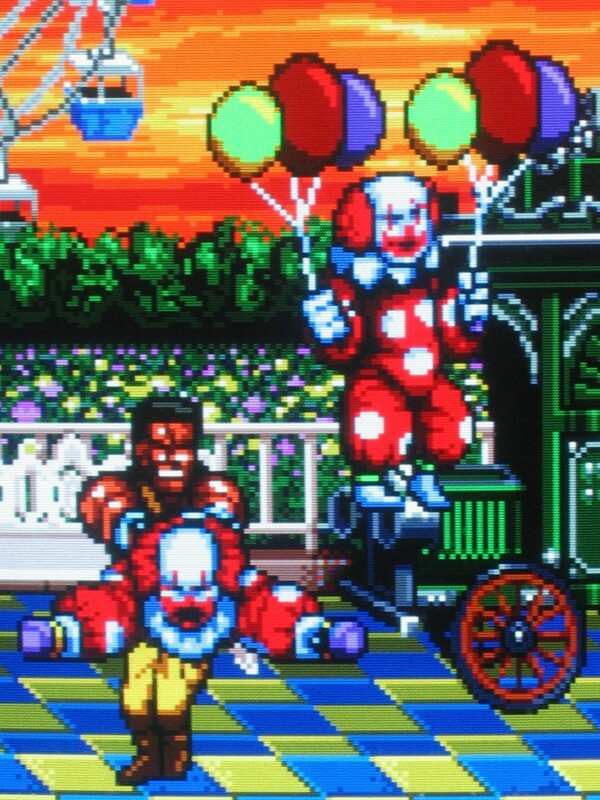 Who didn’t want to use Karnov in a fighting game? The only “dilemma” was picking which one of those three games to rent. The indispensable thing about having your best friend along with you meant he could rent one and you could rent one. 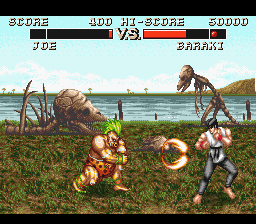 Nelson was adamant on choosing Fighter’s History, the infamous Street Fighter II clone that Capcom even attempted to sue. I was plenty happy about that as I loved Fighter’s History in the arcades and was long anticipating the SNES port. I always felt the game was a bit underrated. Good pick Nelly! Now it was my turn. 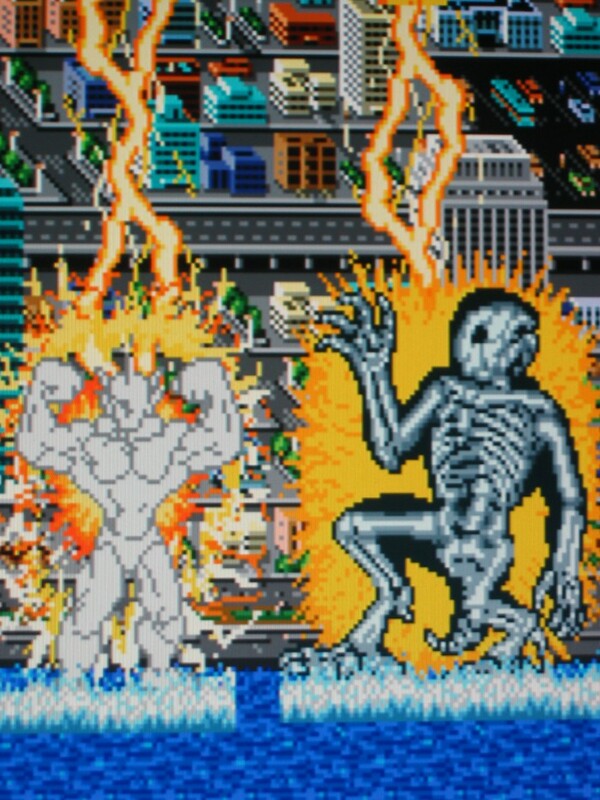 King of the Monsters 2 or Muscle Bomber? Time to put my great white whale to rest! King of the Monsters 2 and I were like two SHIPS PASSING IN THE NIGHT. Somehow, we always missed one another. I never played the arcade once. As a staunch supporter of the original, I was dying to FINALLY play the sequel. From 1992 to 1994, finding a King of the Monsters 2 arcade became my white whale, so to speak. None of the local arcades had it for whatever reason. And the one time that I did find it, it was at an arcade hall 2 hours away from home, but of course the machine was broken. That sums it up perfectly. 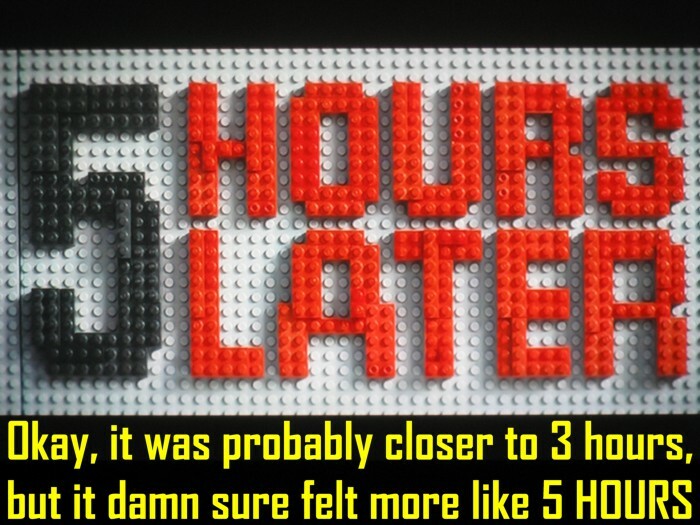 It was that one game that somehow always managed to elude me. Standing there with a choice between Saturday Night Slam Masters or my great white whale, King of the Monsters 2, it dawned on me suddenly which one I was going to pick. As Nelson and I rode home in the backseat talking excitedly about our import finds, it dawned on me that I soon had to face the music. The last time I went rogue and rebelled against my brother he did everything but tear up the house. But I figured with Nelson by my side, maybe Kevin would be less demonstrative. After all, in public or whenever there were guests, Kevin had no choice but to uphold a certain degree of decorum. Nelson knew this even without my having to ask him for backup. That’s how close we were. Like I said at the beginning, nothing completes a healthy childhood quite like having a best friend support you through thick and thin. He gave me a nod as my dad pulled into the driveway; I knew he had my back. The moment of truth had arrived. My dad went inside the house as Nelly and I stood there on the driveway — import games in hand. We were delaying the inevitable. But there’s a reason they call it the inevitable. “Did you get it? ?” my brother asked excitedly as he came to the door a minute later. “Uhhh, no. But I got this,” I stammered, handing the game over to him as if it were an adequate consolation prize. It wasn’t. “King of the Monsters 2? !” A mixture of shock and disgust filled his voice. “Was my game there for rent or not?” His eyes, which had turned into burning coal, burrowed its way deep in my soul. Shoot, you don’t gotta tell me twice! I fled the crime scene faster than OJ Simpson. We wasted no time firing up Nelly’s Super Nintendo. We threw in Fighter’s History first and took turns wasting the computer opponents. We were both impressed by how faithful it was to the arcade original. There was a simplicity to the game that Nelson and I found to be charming. To this day I can’t play Fighter’s History without remembering that fateful Saturday afternoon at Nelly’s. 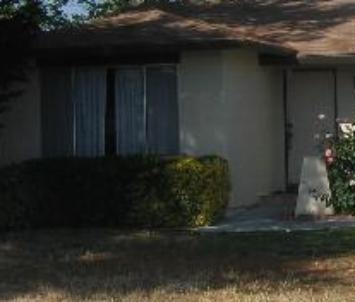 It was so hot that we propped open the living room windows and left the front door wide open. Lee’s stage is SEARED into my retina. That peaceful and calm lake, the family of ducks nibbling away, a fisherman enjoying the great outdoors with his line dipped lazily in the water, and those picture-esque moss-covered hills in the background. Finally, a formation of clouds move their way through the sky in a very haunting and majestic manner. This bucolic stage SCREAMS June 1994 to me. It’s an incredibly nostalgic sight and anytime I see it, I’m transported right back to Nelson’s living room 22 years ago. This stage perfectly captures that whole time frame for me. One look and it feels like I’m 10 hanging out with my best friend on a hot June Saturday afternoon all over again. Then we swapped it out for King of the Monsters 2. He chose Cyber Woo (the King Kong doppelgänger) and I picked Super Geon (the Godzilla lookalike). We waded our way through the various cities demolishing everything in sight. Beating all the bosses 2-on-1 handicap style made for mindless monster mash ‘em up fun. Finally, after several hours of switching between the two games, late afternoon descended upon us and we agreed that maybe Kevin had cool down by now. Nelson headed back with me. We couldn’t hide out at Nelly’s forever. The only question left… was Kevin still pissed? I found out that day that miracles exist when Kevin no longer wanted to kill me. Instead, he wanted to kill giant alien monsters from outer space. It’s funny how we each had our own pet favorite. Nelson liked Cyber Woo, I dug Super Geon and my brother was all about Atomic Guy. The three of us rotated turns and passed off the controller whenever one of us died. On some stages it was Kevin and me. At other times it was Nelly and me. There was even Kevin and Nelson. Seeing them laughing together as they trashed the Grand Canyon was pretty cool. A few hours ago no one could have predicted this outcome. Now watching the two of them working together as one cohesive unit, you never would have thought there was any kind of beef there. It was poetic, even. And of all the gaming memories I harbor, that one remains, still to this day, one of the sweetest ones. It’s a reminder of how gaming has a strange way of bringing people together. 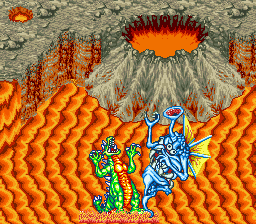 The three of us played King of the Monsters 2 and Fighter’s History to death that unforgettable weekend, before returning them both late on Sunday evening. I told my brother we also saw Saturday Night Slam Masters. He grew pale at the mention, being a Slam Masters fanatic. We’d played it tons in the arcade. He ordered me to go rent it the next weekend. This time in particular, I was more than happy to carry out his command. 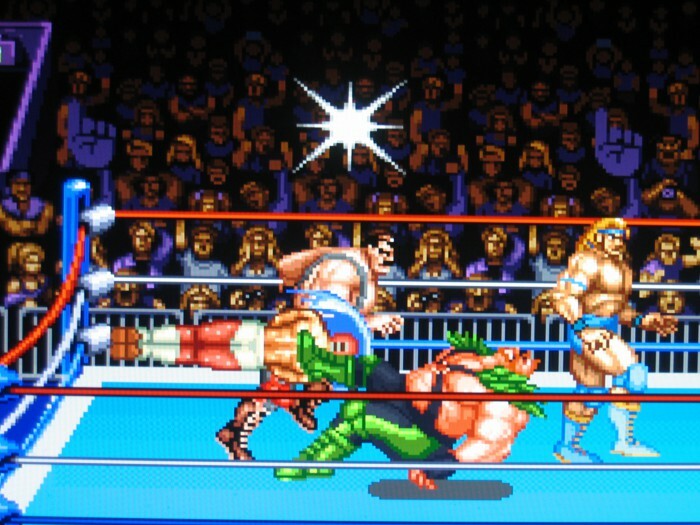 No fat chance of me going rogue, as Slam Masters was also right up my alley with its outlandishly wacky wrestlers and frenetic 4-player mayhem. 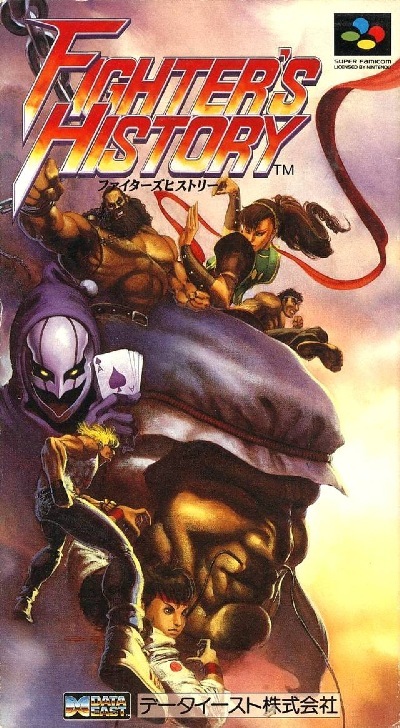 Giant foam fingers, flashing cameras, comic book moves come to life, and Mike F’N Haggar, made Saturday Night Slam Masters or in this case, Muscle Bomber, one fantastic brawl-for-all. Game Hunter eventually closed shop in the late ’90s as rental stores started to become more and more a thing of the past — they were fast going the way of the dinosaur. While their service wasn’t always top-notch, I’ll always remember them fondly for their import selection. Game Hunter arrived during a precious period of my childhood, and at a special time in gaming when renting games blindly and taking weekend trips with your old man was all part of the magic and wonder of the hobby. Sometimes the game you wanted was rented out at the first two or three rental stores, so you had to go to your 4th or 5th option around town to find it.. It just meant more hunting and more quality time spent with your old man. I’ll never forget those days when my dad and I would hit up all the rental stores every Saturday afternoon, rain or shine. They symbolized a simpler time in my life. A time where bills, junk emails and clogged six-lane highways didn’t yet exist. 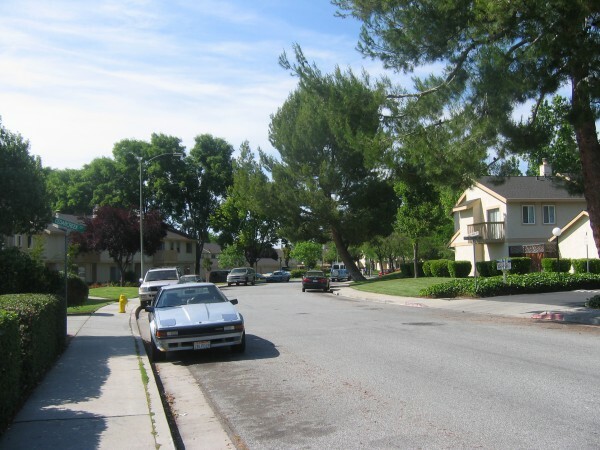 The renting relics of my youth were more than just brick and mortar. They are deeply embedded in what made gaming as a child so magical and wondrous. I’m so thankful I was able to enjoy it with a best pal like Nelson. The summer of 1994 was memorable for many reasons. It’s hard to believe those halcyon days are over twenty years old now. I credit Game Hunter, the Super Nintendo and Nelson for helping to create so many fond memories. 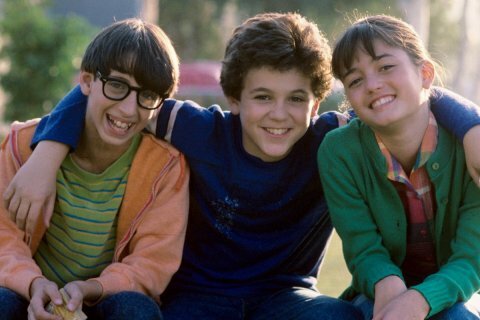 It was in large part thanks to those three that made summer of ’94, the last carefree summer of my childhood, bar none, the best one I had as a kid.